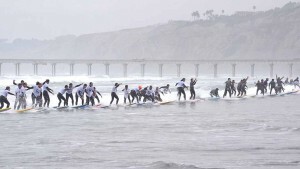 After falling short last year, an effort to set a world record for most surfers sharing a single wave returns this month to La Jolla Shores. The Guinness World Record was set eight years ago in Cape Town, South Africa, when 110 surfers rode a single wave to shore. In January 2016, San Diego managed 97 for a single wave — on the 13th of 18 attempts. 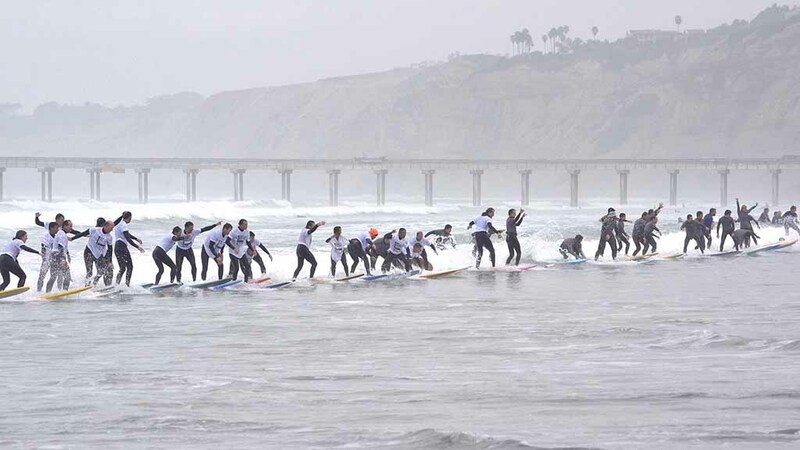 The 1 Wave Challenge on Saturday, Jan. 21, benefits Boys to Men Mentoring Network, a San Diego nonprofit that guides high-risk and fatherless boys. Fueled by Boys to Men’s partnership with The Century Club of San Diego’s Champions for Youth campaign and a Title Sponsorship by Dr. Bronner’s, the 1 Wave Challenge will tee off the 2017 Farmers Insurance Open Golf Tournament, starting Jan. 26. “We are proud to build on this exciting partnership with The Century Club, Champions for Youth and the Farmers Insurance Open,” said Boys to Men Executive Director Craig McClain. The second annual event will be limited to 180 surfers, who must raise a minimum of $250 to take part. Surfers will be treated to breakfast, a schwag bag – including a commemorative T-shirt, hat and rash guard – and a beachside concert performed by local beach-rock band, Sandollar. Runners can enter a related event: the Torrey Pines Adventure Run. Starting and finishing on the beach at La Jolla Shores, the 5-mile run will have runners racing to the back fence of the Torrey Pines South golf course. The race route will showcase the La Jolla coastline, while exposing runners to its rugged terrain and expansive vistas. Hosted by Easy Day Sports and timed to coincide with the 1 Wave Challenge, the adventure run will allow runners to finish their race and then watch the surfing spectacle unfold. Fee for the Torrey Pines Adventure Run is $60. But refund will be given any runner who raises $250 or more for the Boys to Men Organization. Limited to 500 runners, the race features a men’s and women’s elite division, a general classification time-trial start, age-group awards and breakfast. “The 1 Wave Challenge is a fun and rewarding way to recruit new mentors into the Boys to Men community,” said Ernie Hahn, longtime general manager of the Valley View Casino Center.